The time has surely come for tourism to return to Sri Lanka. The war’s been over for 10 years, there are no longer police road blocks everywhere – and this is surely one of the loveliest countries on the planet. It’s also one of the most diverse with tea plantations and hill stations where you can escape the heat, tropical forests, beautiful beaches, a fascinating culture with ancient Buddhist temples (some of them carved into caves) and the most exotic wildlife. Peacocks, for instance, are everywhere – sitting in trees, strutting along riverbanks and piercing the air with their raucous cries, so unlike their glamorous appearance. My time was limited and this is a surprisingly big island, so I had to make a choice. I decided to head south. In fact, landing in Colombo, you’re already pretty far south to start with, so there was a logic to this. 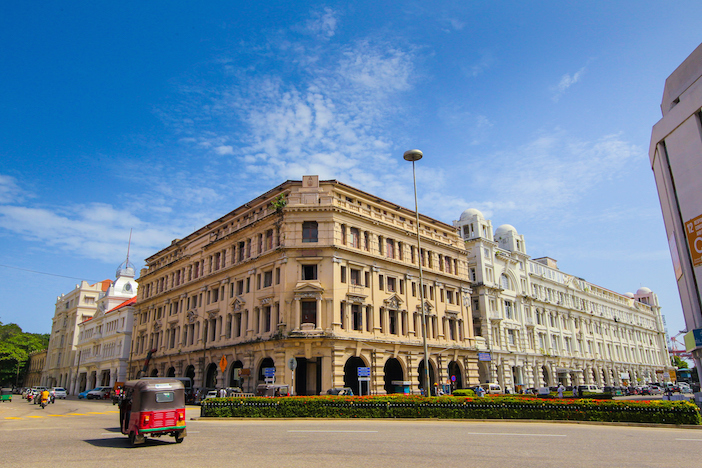 Colombo itself is coming back to life, many of its old colonial buildings are being restored and there’s a feeling of regeneration on the street. 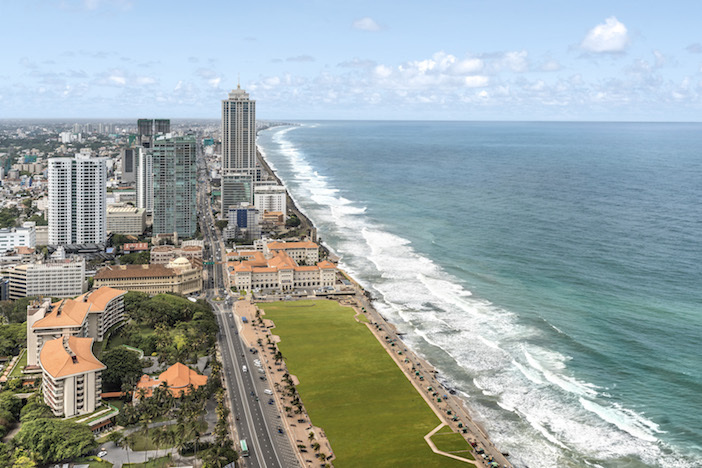 The most obvious sign of this is the vast “new city” of Colombo being built by the Chinese on reclaimed land. The new city is still very much at an embryonic stage. But I was more interested in the old one. 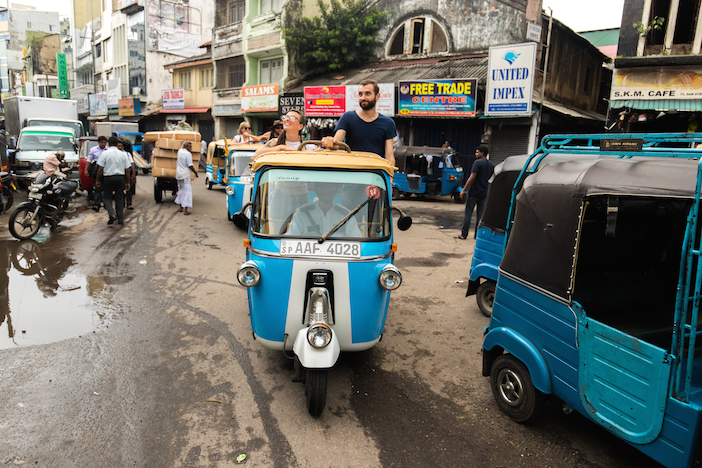 I set out for a city tour by tuk-tuk arranged by the hotel and with a suitably smart driver. Kavi was wearing whites with plenty of frogging and a smart cap. I wouldn’t have been surprised if he’d saluted. There’s a lot of colonial Britain here still – and it’s not just in the architecture, high tea being something of a national pastime. So we visited two remarkable temples, Hindu (Kailasanadher) and Buddhist (Gangaramir) with its vast ancient tree, originally a cutting from the original Bodhi tree under which the Buddha meditated. We went through markets of all kinds and had drinks – ginger-flavoured coffee and drinking coconuts. We saw quite a few of the British-era colonial buildings but explored them in more detail later in the afternoon on a walking tour with Mark Forbes, local photographer turned architectural expert. Nothing of that era survives. When the Brits arrived, we turned the canals into roads, started the tea plantations and suddenly the place – then Ceylon – was thriving. We built everywhere – government buildings, banks, bridges, railways – all of which is there today and, while much of it suffered during 30 years of war, restoration is well underway. We finish with a G&T on the verandah of the Grand Oriental Hotel. 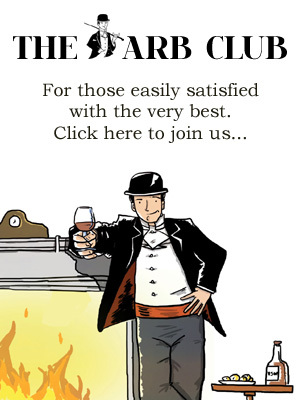 Well, you would, wouldn’t you? After this, we were off to the further end of the south coast and another Shangri-la Hotel at Hambantota. 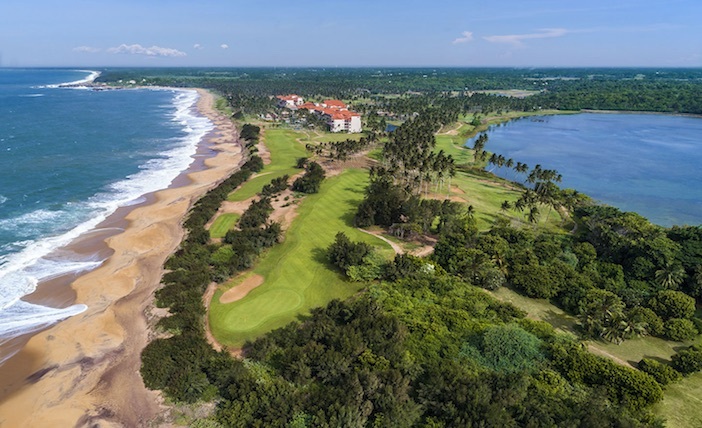 This is the only golf resort in Sri Lanka (the wind can make it fun at the holes closest to the sea) and it sits on a white sandy beach. There is yoga in the mornings, a lovely spa set in a perfumed garden, a kids’ centre and several restaurants. It is also a spectacular wildlife area. Our first trip was on water – a riverboat safari on the Walawe River in a small fishing boat with an outboard motor, the fisherman and a guide. This is a peaceful spot and the only other people on the water were two fishermen catching gigantic prawns in the river. The rest was just the wildlife. Just? There were whole families of gray langur monkeys, dozens of flying foxes (aka fruit bats) like old rags caught in the trees – and crocodiles. I wasn’t sure how close I wanted to get to the crocodiles and fortunately (for me) only saw a swiftly disappearing tail. The birds were everywhere – different kinds of kingfisher, eagles, ibis, cormorants, kites, herons, parakeets, bee-eaters and orioles. A fish owl sat blinking in a shady tree. Best of all was the water buffalo who eyed us slightly warily as we floated past his bathing spot. The next day it was elephants. I had to get up at 5.30am for this but it was worth every lost moment of sleep. Setting out in the dark in an open-sided high-rise jeep, a shooting star lit up the lagoon and figures appeared on the roadside in the passing headlights (three Buddhist monks glowing saffron). By six, it is light and we’re driving past papaya, coconut and banana plantations on the way to the Udawalawa national park. It’s a pretty bumpy ride but through the park but you see plenty of elephants as well as birdlife – including the ubiquitous peacock. 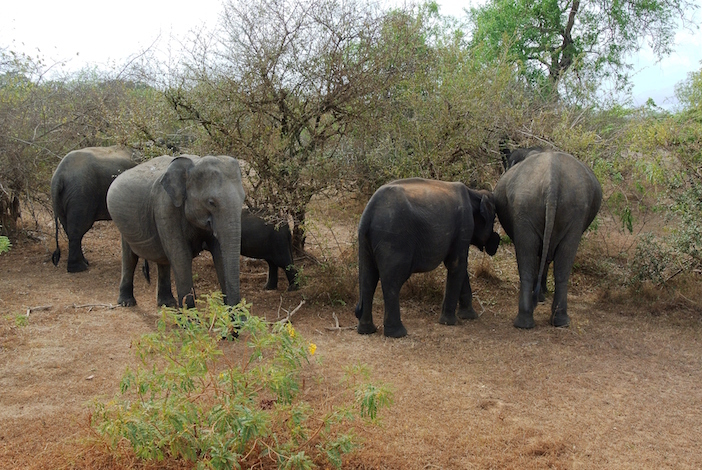 Just down the road from the national park, you can drop into Sri Lanka’s Elephant Orphanage. The elephants’ natural habitat is threatened in the country due to the growth in population and a resulting expansion in settlements and agriculture. Humans and elephants come into conflict and it is the humans who are the winners. Around 15 baby elephants, orphaned or abandoned, are taken into the care of the Elephant Transit Home and rehabilitated until they’re able to be released back into the jungle. In the meantime, you get to watch them enjoying their breakfast – milk delivered by hosepipe straight into the mouth, followed by leaves and branches. Our last stop was Galle, surfers’ paradise and UNESCO world heritage site – a jewel of a town on the island’s southwestern tip. It’s the largest remaining fortress built by Europeans in Southeast Asia and is a remarkable blend of Portuguese and local styles. It’s a buzzy, laidback kind of place with lots of shops and restaurants and ideal if you want to buy a jewel or two. 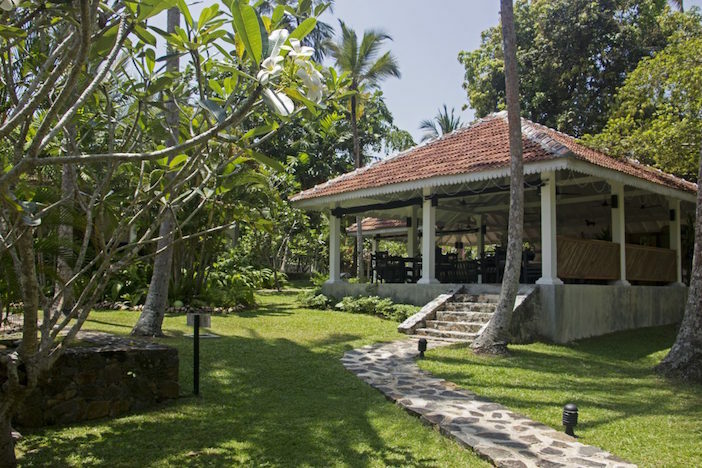 (Staying at the Why House Hotel just outside Galle, I went with manager Henrietta Cottam to her favourite jewellers – friends of madam get a 25% discount.) Immediately outside the walls of the fort is Galle International Stadium, one of the world’s most famous and photogenic cricket grounds. Why House is a ten-room classic boutique hotel set in a tropical garden with an open sided dining pavilion and bar in the centre. There’s a vast swimming pool and, in Henrietta, a host to welcome you with open arms, take you shopping (not just for jewels), arrange tours, teach you local cooking and generally make you one of the family. 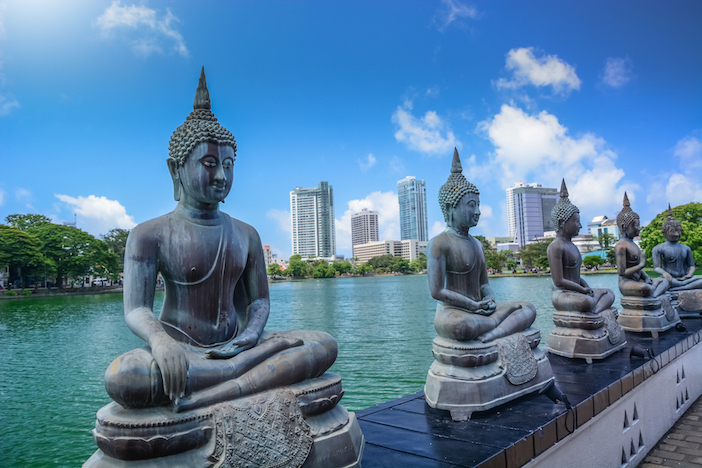 For details of the Shangri-La properties in Colombo and on the South Coast, visit www.shangrila.com. For more information on Why House in Galle, visit www.whyhousesrilanka.com. The national dish of Sri Lanka is the hopper. The first one I saw completely confused me as I thought it was the bowl that the food was being served in. 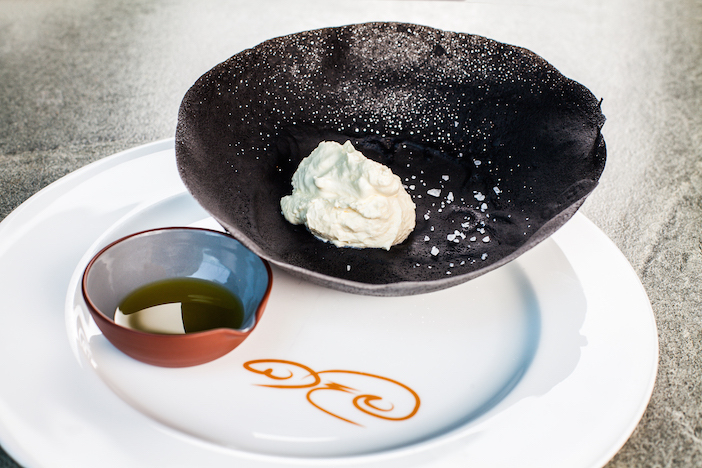 It sort of is, but the bowl is just as edible being made of rice flour, coconut milk and eggs. It can appear at breakfast but my first one was in the evening when I went to Shangri-la Colombo’s signature restaurant, Kaema Sutra where they do a very contemporary twist on the traditional local cuisine.